Nothing makes me happier than to hear The Boy asking us to read to him. I will drop everything, when he says those three words. According to "The More You Know" website, only 46% of parents read to their children everyday. Reading is one of the greatest gifts we can give our kids. It's not about having the time, it's about making the time. All you need is 15 - 30 minutes a day. Brown Bear, Brown Bear What Do You See? We started reading these books to The Boy when he first started Early Intervention. Our ABA 'homework' was to read this book 3 times a day. I read it to The Boy in the morning, before I went to work. In the afternoon, after the therapist left. And again, right before bed. Once he started to point, I asked him to point to the pictures. Once he started to talk, I let him finish the sentences. Dr. Seuss There are just too many titles to choose from. The first Dr. Seuss book we started reading was Mr. Brown Can Moo. Again, another suggestion from our ABA therapist. I can't tell you how often we've read this book. But we also enjoy, Green Eggs and Ham, The Cat in the Hat, Hooper Humperdink Not Him, One Fish Two Fish, Hop on Pop, How the Grinch Stole Christmas. And my personal favorite: Oh! The Places You'll Go! 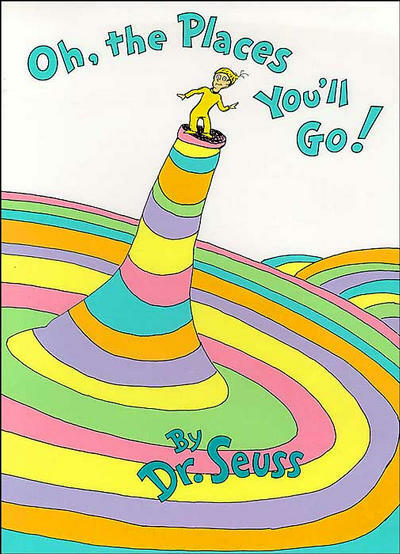 You can never go wrong with Dr. Seuss! Mercer Mayer Little Critter series. I can't remember the first book we bought. But we have a lot of them. The Boy especially loves to read Just Me & My Mom, Just Me & My Dad, I Was So Mad, All By Myself and Just Go To Bed. This series has done a lot for the boys social interaction, independence with self help skills and imaginative play. He scripts from all of these books - but he uses the language appropriately. He has a desire to communicate, I believe these books help. We also enjoying reading - There a Nightmare in My Closet. Over the Rainbow This book comes with a CD. The Boy started reading it in school. And he'd come home singing it. So I had to buy it for him. Now we sit and read it together while singing along with the CD. Frog & Toad The Husband gets all the credit for this one. I try to read these books to The Boy, but he always pushes me away and says, "Daddy to read." Harold & The Purple Crayon What's not to love about Harold?! Where the Wild Things Are Another book I enjoyed reading as a kid. The Boy really loves this book. He reminds me so much of Max. I purchased the stuffed animals. And do he takes them, puts Max into a toy boat and he acts out the story. I love it! The Napping House This is a nice book to read, especially at bedtime. It has such a calm rythmic flow. The Boy loves it! And the CD - is just as soothing. I Love You Through & Through I started reading this book when The Boy was a baby. Before EI, before the diagnosis. And it's still one of my favorite books to read with him. I want him to know how much I love him. And this book explains it pretty well. Chica Chica Boom Boom The Boy loves letters. So it's a no brainer as to why he loves this book. We've bought it 6 times because he keeps tearing the books. We also have the tree so we do it together to make it interactive. Go Away, Big Green Monster! The Boy's Early Intervention speech therapist introduced us to this book. There's also a puppet that goes with it. We bought that separately from Lakeshore. Dinosaurs Love Underpants The Boy is going through a dinosaur phase. He was introduced to this book in school. And so, whenever he likes a book, I buy it. (We're on our 3rd copy) It's a silly book to read. And I love hearing The Boy read the names of the dinosaurs. Biscuit Although The Boy does not like dogs, he sure loves Biscuit books. The Boy is starting to become interested in reading. So we've been slowly introducing "My First I Can Read" books to his library. TV. If kids are entertained by two letters, imagine the fun they'll have with twenty-six. Open your child's imagination. Open a book. Wordless Wednesday: "It's time for bed." 101 Ways to Say "Good Job"